Scheila, which is overexposed in this composite. in this image to reveal the faint dust features. during the exposure, the star images are trailed. Astronomers have known for decades that comets contain icy material that erupts when warmed by the sun. They regarded asteroids as inactive rocks whose destinies, surfaces, shapes and sizes were determined by mutual impacts. However, this simple picture has grown more complex over the past few years. The two teams found the observations were best explained by a collision with a small asteroid impacting Scheila's surface at an angle of less than 30 degrees, leaving a crater 1,000 feet across. Laboratory experiments show a more direct strike probably wouldn't have produced two distinct dust plumes. The researchers estimated the crash ejected more than 660,000 tons of dust -- equivalent to nearly twice the mass of the Empire State Building. 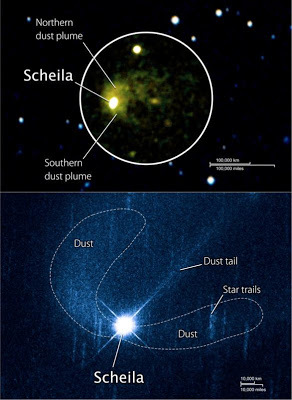 "The dust cloud around Scheila could be 10,000 times as massive as the one ejected from comet 9P/Tempel 1 during NASA's UMD-led Deep Impact mission," said co-author Michael Kelley, also at the University of Maryland. "Collisions allow us to peek inside comets and asteroids. Ejecta kicked up by Deep Impact contained lots of ice, and the absence of ice in Scheila's interior shows that it's entirely unlike comets." NASA's Goddard Space Flight Center in Greenbelt, Md., manages Hubble and Swift. Hubble was built and is operated in partnership with the European Space Agency. Science operations for both missions include contributions from many national and international partners.